What are assignment rules in salesforce? Assignment rules are used to automatically assign lead or Case to owner(User Or Queue). Its used to automate owner assignment on Case and Lead based on conditions on Case or Lead. Lead Assignment Rules : Specify how leads are assigned to users or queues as they are created manually, captured from the web, or imported via the Data Import Wizard. Case Assignment Rules : Determine how cases are assigned to users or put into queues as they are created manually, using Web-to-Case, Email-to-Case, On-Demand Email-to-Case, the Self-Service portal, the Customer Portal, Outlook, or Lotus Notes. From Setup, enter Assignment Rules in the Quick Find box, then select either Lead Assignment Rules or Case Assignment Rules. Choose New, and then give the rule a name. Specify whether you want this to be the active rule for leads or cases created manually and via the web and email. Then click Save. Order : Sets the order in which the entry will be processed in the rule, for example, 1, 2, 3. Salesforce evaluates each entry in order and tries to match the criteria of the entry. As soon as a match is found, Salesforce processes the item and stops evaluating the rule entries for that item. If no match is found, the item is reassigned to either the default Web-to-Lead owner, the administrator doing a lead import, or the default case owner. Criteria :Specifies conditions that the lead or case must match for it to be assigned.Enter your rule criteria. Choose criteria are met and select the filter criteria that a record must meet to trigger the rule.For example, set a case filter to Priority equals High if you want case records with the Priority field marked High to trigger the rule. If your organization uses multiple languages, enter filter values in your organization’s default language. You can add up to 25 filter criteria, of up to 255 characters each. When you use picklists to specify filter criteria, the selected values are stored in the organization’s default language. If you edit or clone existing filter criteria, first set the Default Language on the Company Information page to the same language that was used to set the original filter criteria. Otherwise, the filter criteria may not be evaluated as expected. Choose formula evaluates to true and enter a formula that returns a value of “True” or “False.” Salesforce triggers the rule if the formula returns “True.” For example, the formula AND(ISCHANGED( Priority ), ISPICKVAL (Priority, “High”) ) triggers a rule that changes the owner of a case when the Priority field is changed to High. If your condition uses a custom field, the rule entry will be deleted automatically if the custom field is deleted. User : Specifies the user or queue to which the lead or case will be assigned if it matches the condition. Users specified here cannot be marked “inactive” and they must have “Read” permission on leads or cases. Do Not Reassign Owner : Specifies that the current owner on a lead or case will not be reassigned to the lead or case when it is updated. Email Template : Specifies the template to use for the email that is automatically sent to the new owner. If no template is specified, no email will be sent. When assigning a lead or case to a queue, the notification goes to the Queue Email address specified for the queue and all queue members. Predefined Case Teams : Specifies the predefined case team(s) to add to a case when it matches the condition. A case team is a group of people that work together to solve cases. Replace any existing predefined case teams on the case : Specifies that any existing predefined case teams on the case are replaced with the predefined case teams on the condition, when a case matches the condition. After creating the entry, click Save, or Save & New to save the entry and create more entries. For more details about assignment rules please refer to assignment rules official link. apex:repeat is an iteration component that allows you to output the contents of a collection according to a structure that you specify. The collection can include up to 1,000 items. Note that if used within an <apex:pageBlockSection> or <apex:panelGrid> component, all content generated by a child <apex:repeat> component is placed in a single <apex:pageBlockSection> or <apex:panelGrid> cell. first Integer The first element in the collection visibly rendered, where 0 is the index of the first element in the set of data specified by the value attribute. For example, if you did not want to display the first two elements in the set of records specified by the value attribute, set first="2". Id String An identifier that allows the repeat component to be referenced by other components in the page. rendered Boolean A Boolean value that specifies whether the component is rendered on the page. If not specified, this value defaults to true. rows Integer The maximum number of items in the collection that are rendered. If this value is less than the number of items in the collection, the items at the end of the collection are not repeated. value Object The collection of data that is iterated over. var String The name of the variable that represents the current item in the iteration. When we use pageBlockTable then all salesforce styles are inherited. But when we use apex:repeat we have to manually add table tr td tags and all styles. Advantage of using apex:repeat is that we have more control on display of data. What is Salesforce Governor Limits? Apex runtime engine strictly enforces limits to ensure that runaway Apex code or processes don’t monopolize shared resources. Why Salesforce has Governor Limits? Because Apex runs in a multitenant environment, the Apex runtime engine strictly enforces limits to ensure that runaway Apex code or processes don’t monopolize shared resources. If some Apex code exceeds a limit, the associated governor issues a runtime exception that cannot be handled. In this post we will mainly cover Per-Transaction Apex Limits. These limits count for each Apex transaction. For Batch Apex, these limits are reset for each execution of a batch of records in the execute method. This table lists limits for synchronous Apex and asynchronous Apex (Batch Apex and future methods) when they are different. Otherwise, this table lists only one limit that applies to both synchronous and asynchronous Apex. This table can be used as salesforce governor limits cheat sheet. Use batch apex if you are working for more than 50000 records. Never make any SOQL, DML operation inside the loop. aura if renders the content within the tag if the isTrue attribute evaluates to true. The framework evaluates the isTrue expression and instantiates components either in its body or else attribute. aura:if instantiates the components in either its body or the else attribute, but not both. aura:renderIf instantiates both the components in its body and the else attribute, but only renders one. If the state of isTrue changes, aura:if has to first instantiate the components for the other state and then render them. We recommend using aura:if instead of aura:renderIf to improve performance. Assuming that we have same 4 attributes available. This should not be displayed as variable2 is false so else part will execute. This should be displayed as if condition is not satisfied. and Example. As variable1 is true and variable2 is false so nothing will be displayed. and Example. As variable1 is true and variable3 is true so it will be displayed. or Example. As variable1 is true and variable2 is false so it will be displayed. or Example. As variable2 is false and variable4 is false so it will not be displayed. Many time we have requirement to generate random number in Apex. It can be achieved using Math.random() function. This method return a positive Double that is greater than or equal to 0.0 and less than 1.0. This method only returns number between 0.0 and 1.0. Now its important how we can use this method to generate different variation of random number that we need based on our requirements. Lets see some examples of getting random number. Delete Lightning Component in Salesforce is very easy. If we don’t want to use IDE like sublime or Eclipse then we can use developer console. What is salesforce order of execution? What is order of execution in salesforce? When you save a record with an insert, update, or upsert statement, Salesforce performs the following events in order. Loads the original record from the database or initializes the record for an upsert statement. Loads the new record field values from the request and overwrites the old values. When the request comes from other sources, such as an Apex application or a SOAP API call, Salesforce validates only the foreign keys. Before executing a trigger, Salesforce verifies that any custom foreign keys do not refer to the object itself. 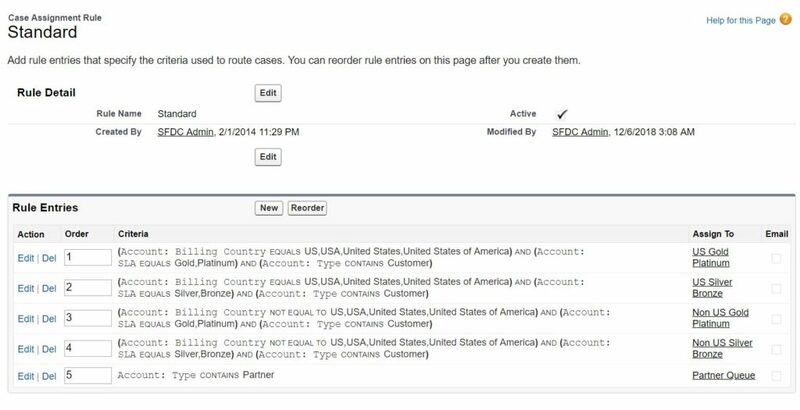 Salesforce runs user-defined validation rules if multiline items were created, such as quote line items and opportunity line items. Runs most system validation steps again, such as verifying that all required fields have a non-null value, and runs any user-defined validation rules. The only system validation that Salesforce doesn’t run a second time (when the request comes from a standard UI edit page) is the enforcement of layout-specific rules. Executes duplicate rules. If the duplicate rule identifies the record as a duplicate and uses the block action, the record is not saved and no further steps, such as after triggers and workflow rules, are taken. Saves the record to the database, but doesn’t commit yet. If there are workflow field updates, updates the record again. If the record was updated with workflow field updates, fires before update triggers and after update trigger one more time (and only one more time), in addition to standard validations. Custom validation rules, duplicate rules, and escalation rules are not run again. When a process or flow executes a DML operation, the affected record goes through the save procedure. If the record contains a roll-up summary field or is part of a cross-object workflow, performs calculations and updates the roll-up summary field in the parent record. Parent record goes through save procedure. If the parent record is updated, and a grandparent record contains a roll-up summary field or is part of a cross-object workflow, performs calculations and updates the roll-up summary field in the grandparent record. Grandparent record goes through save procedure. Executes Criteria Based Sharing evaluation. Commits all DML operations to the database. Executes post-commit logic, such as sending email. Note the following when working with triggers. The order of execution isn’t guaranteed when having multiple triggers for the same object due to the same event. For example, if you have two before insert triggers for Case, and a new Case record is inserted that fires the two triggers, the order in which these triggers fire isn’t guaranteed. What are Trigger context variables in salesforce? All triggers define implicit variables that allow developers to access run-time context. These variables are contained in the System.Trigger class. Following are the context variable available in triggers. Please note variable availability in trigger varies according to the type of trigger events. isExecuting: Returns true if the current context for the Apex code is a trigger, not a Visualforce page, a Web service, or an executeanonymous() API call. isInsert: Returns true if this trigger was fired due to an insert operation, from the Salesforce user interface, Apex, or the API. isUpdate: Returns true if this trigger was fired due to an update operation, from the Salesforce user interface, Apex, or the API. isDelete: Returns true if this trigger was fired due to a delete operation, from the Salesforce user interface, Apex, or the API. isBefore: Returns true if this trigger was fired before any record was saved. isAfter: Returns true if this trigger was fired after all records were saved. new: Returns a list of the new versions of the sObject records. This sObject list is only available in insert, update, and undelete triggers, and the records can only be modified in before triggers. newMap: A map of IDs to the new versions of the sObject records. This map is only available in before update, after insert, after update, and after undelete triggers. old : Returns a list of the old versions of the sObject records. This sObject list is only available in update and delete triggers. oldMap: A map of IDs to the old versions of the sObject records. This map is only available in update and delete triggers. size: The total number of records in a trigger invocation, both old and new. You can use an object to change its own field values using trigger.new, but only in before triggers. In all after triggers, trigger.new is not saved, so a runtime exception is thrown. Apex triggers enable you to perform custom actions before or after events to records in Salesforce, such as insertions, updates, or deletions. Just like database systems support triggers, Apex provides trigger support for managing records. Use triggers to perform tasks that can’t be done by using the point-and-click tools in the Salesforce user interface. For example, if validating a field value or updating a field on a record, use validation rules and workflow rules instead. What are the various event on which a trigger can fire? A trigger is a set of statement which can be executed on the following events. In above trigger events one or more of below events can be used with comma separated. What are different type of Triggers? Before triggers are used to perform a task before a record is inserted or updated or deleted. These are used to update or validate record values before they are saved to the database. After triggers are used if we want to use the information set by Salesforce system and to make changes in the other records. are used to access field values that are set by the system (such as a record’s Id or LastModifiedDate field), and to affect changes in other records. The records that fire the after trigger are read-only. What are the considerations while implementing the Triggers? Consider the following before implementing the triggers. Field history is updated after the trigger has successfully finished processing data. Any callout should be asynchronous so that trigger does not have to wait for the response. A trigger cannot have a static keyword in its code. If a trigger completes successfully the changes are committed to the database and if it fails the transaction is rolled back. Read the Apex Developer Guide for more detailed considerations. What are context variables in triggers? Refer to Trigger context variables in salesforce link for more details. How is Trigger.New Different from Trigger.newMap? Trigger.New variable returns the list of sObject which has invoked the trigger and Trigger.NewMap returns the map of ID’s with the newly entered records. NewMap is only available in after insert, before and after the update and after undelete. How is Trigger.new different from Trigger.old? Can a trigger call a batch class? Yes, we can call a batch class in the trigger as we do in the normal apex code. Can a trigger make a call to Apex callout method? we can call a callout method in Apex Trigger but the only condition is that it has to be an asynchronous callout because the trigger flow cannot wait on the response received by the callout method. Define Recursive Trigger and how to avoid it? What do you mean by the bulkifying trigger? Write triggers that operate on collections of sObjects. Write triggers that perform efficient SOQL and DML operations. If we will not follow above point we may hit governor limit when records are created/updated/deleted in mass using data loader or other tool. Is there any limit on number of triggers define on an object? We can define as many triggers on an object as we want but it is recommended to have one trigger per object because the order of execution of different trigger is not guaranteed and any trigger can fire first. Can you explain the order of execution in Triggers? Following is the order of execution of events which Salesforce perform before a DML Event. The record is loaded from the database or is initialized in case of upset statement. If the request originates other than UI then Salesforce only checks for Validation of foreign keys. Now all the before triggers are executed at the database. Most of the validations are performed again to verify that all the required fields are holding some values and are not null, at this step user defined validations are also executed and the only validation which is not repeated in this step are the rules specific to the layout. After the success of the previous step, the record is reviewed for duplicate records, by running the duplicate rule. If a duplicate is found the flow is stopped and no further actions performed. In this step, record is saved to the database but it not committed yet. Now all the after Triggers are executed. In this step, assignment rules are executed. Now if there is any auto-response rule is present then they are executed. Next in the queues are the workflow, they are executed after the auto response. If the workflow was updating a field, then the fields updated in this step and the flow after this step varies if this was the case. If a field was updated then the before and after update triggers are fired once more and standard validation are also executed again. Custom validation escalation rule and duplicate rules are not required to run again. Once the execution has reached this stage, then process is fired if there are any declared on the object. Now the escalation rules are executed. Entitlement rules are executed if any. If there are any roll-up summary field, then they are calculated at this step and the parent object go through the save process. Now the sharing rules are executed. If we reach this stage, then that means no error has occurred and the data is ready to be committed to the database and is committed now. Now if there is any post-commit logic like email, then that is executed. I will keep adding more questions to Salesforce Interview Questions on Triggers. Spinners are CSS loading indicators that should be shown when retrieving data or performing slow computations. lightning:spinner displays an animated spinner image to indicate that a request is loading. This component can be used when retrieving data or performing an operation that takes time to complete. 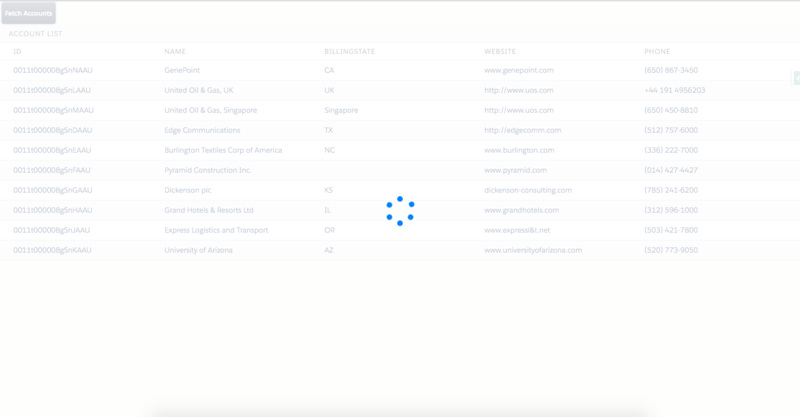 aura:waiting and aura:donewaiting can be used for controlling the loading spinner. What is aura:waiting and aura:doneWaiting? There are two ways of showing lightning spinner. First is using lightning design system. //set response value in accListToDisplay attribute on component. A lightning:spinner displays an animated spinner image to indicate that a feature is loading. This component can be used when retrieving data or anytime an operation doesn’t immediately complete. Apex class code will be same. There will be slight difference in Lightning component and client side controller.